Buenos Aires is so massive in size and can be a little overwhelming. What to do? What to see? Here’s my list of top things to do in Buenos Aires. 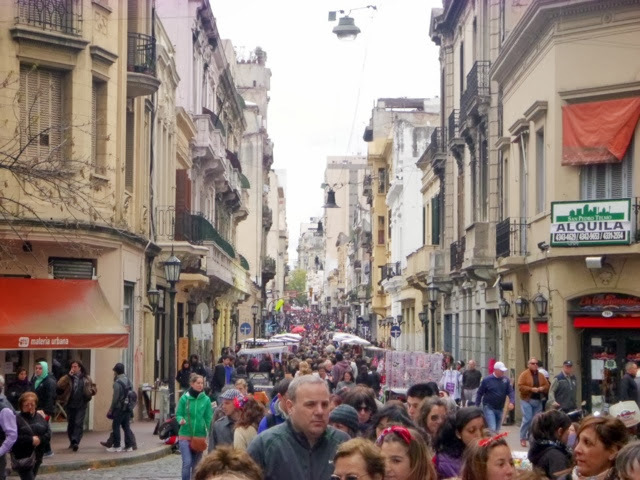 Calle Defensa shuts down and the glorious San Telmo markets stretch for quite some blocks. You can find anything from street performers, food, scarves, jewelry, clothes, hand made ornaments and mate cups to antiques. Get lost amongst the crowds of people and take in all the market stall owners talents. Tango is a big part of the Argentinian culture and what better way to immerse yourself in the culture than to see a tango show? Dancers are often performing Tango acts in the streets which is great to see but there are also plenty of Tango theatres to be found around the city as well, most which also give you the option of dinner and a show. Perfect! I personally went to Tango Complejo and was not disappointed! 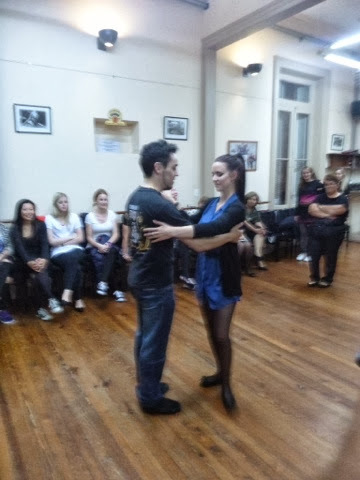 For $380 Argentinian Pesos ($70 AUD) you get a tango lesson, an amazing 3 course meal, a bottle of wine per person and an awesome tango show. How amazing does that sound!? As I said above Tango is a big part of the culture here so why not give it a go yourself? Test your moves out on the dance floor as you change partners every few minutes and get your toes stepped on plenty of times. You might even get a certificate at the end of it like I did. You’ll get a great laugh out of it if nothing else. Recoleta is one of the richest Barrios in Buenos Aires. The cemetery is one of the biggest attractions there and holds some of the most expensive real estate in the city. Walk amongst the amazing tombs that have some of the best architecture, some dating back to the 1800s. 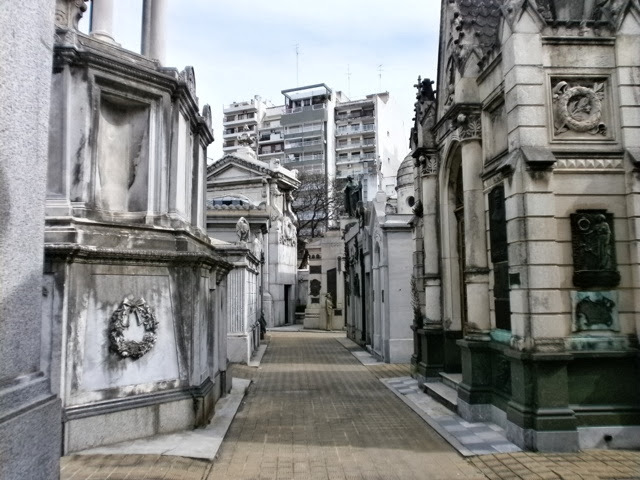 In there you will see the tombs of plenty rich and famous Argentinians of the past including Evita Peron. Try not to get creeped out by the coffins in the windows and the creepy cats wandering around. 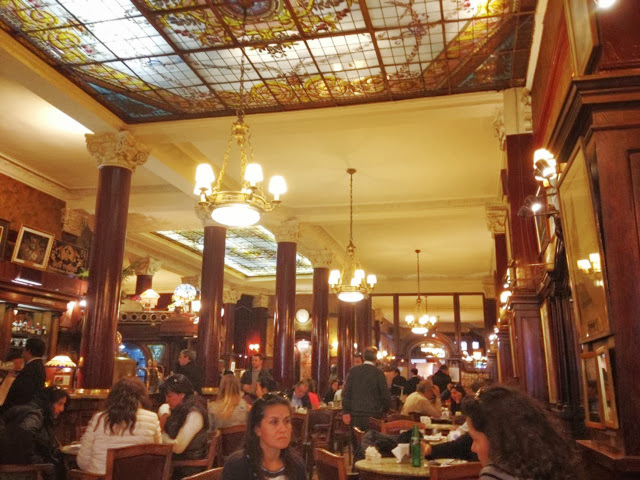 Argentina has a big cafe culture. Plenty of cafés line the streets and you can see people have cafés (coffee) and medialuna’s (croissants) at any time of the day. The perfect place to experience this is at Cafe Torton. This cafe has been open since 1854 and has been a seen in several movies and hosts plenty of celebrity’s each year. The decor is beautiful and the waiters serve you wearing full dinner suits, including bow ties! 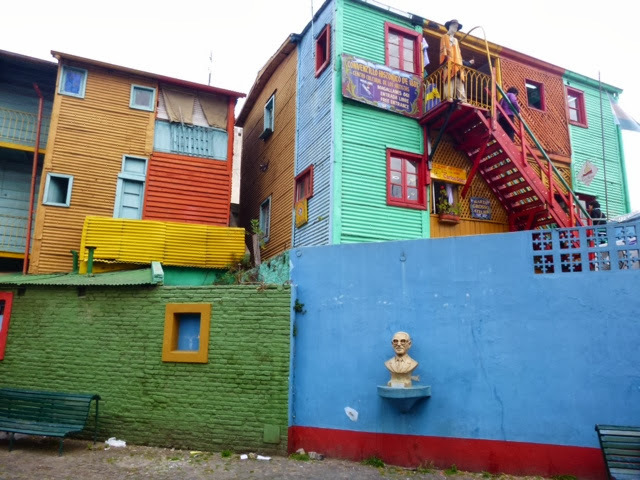 The Barrio of La Boca used to be home to hundreds of Italian immigrants. The Caminito is a short pedestrian street lined with colourful corrugated-metal buildings. It’s also filled with markets, tango dancers and plenty of colourful artwork from local artists. Stick the main tourist strip, hang onto your belongings and take in all the vibrant colours. Palermo is perhaps one of the trendier Barrios of Buenos Aires. Filled with large green parks, boutique shops, fancy restaurants and classy bars and clubs. Shop til you drop, take a nice stroll around one of the parks or sit back, relax and have a coffee and one of the many cafés lining the streets. Dulce de Leche is HUGE in Argentina. It is basically condensed milk that has been cooked and turned into a thick caramel, it is to die for!! You can find it in pastries, cakes, ice creams and anything else delicious. I may have just eaten it with a spoon a few times too…ooops! 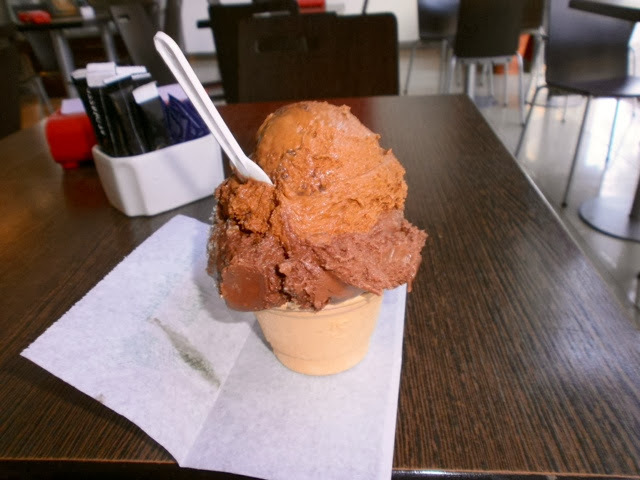 Huge serving of dulce de leche helado. Yummmmmmm! Puerto Madero is the most modern Barrio of Buenos Aires, with big high rise buildings and expensive restaurants. It is also the port where all the boats come in and out. 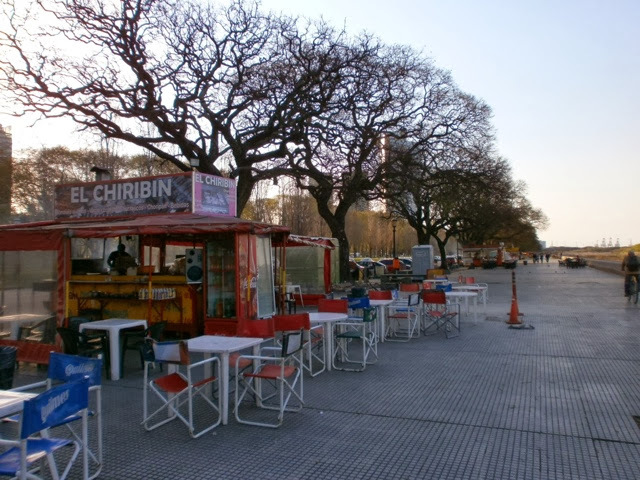 It has a nice big park and river front area to take a nice relaxing stroll around and also has plenty of stall selling super panchos (hot dog) and Choripans (chorion in a bun with chimi churi sauce) Delicious and cheap! Argentina is well known for its amazing Argentinian beef. They have so many different cuts of meat you would have never seen or heard of before. They are cooked on a big grill so they are super tender and also have that delicious smokey BBQ flavour to them. Order the Bife de Chorizo, a boneless cut of meat. Don’t expect anything less than 400g of meat so come with an appetite! My favourite places are La Brigada, San Telmo, La Posado, Down town and La Cabrera, Palermo. Our waiter actually cut our steak with a spoon at La Brigada. 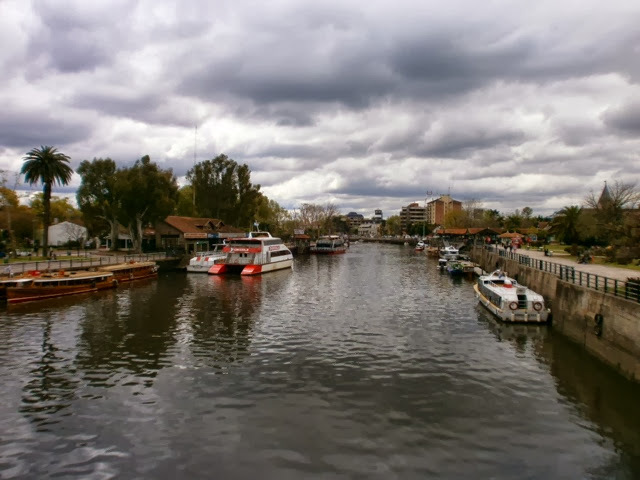 Tigre is a cute little down located an hour outside of Buenos Aires and is easily accessible by train. It’s named Tigre after the tigers and jaguars that used to be hunted here years ago. It has lots of water ways and canals that make river cruises popular, or you can just take a nice walk, take in the nice river views and get some lunch at one of the many restaurants. 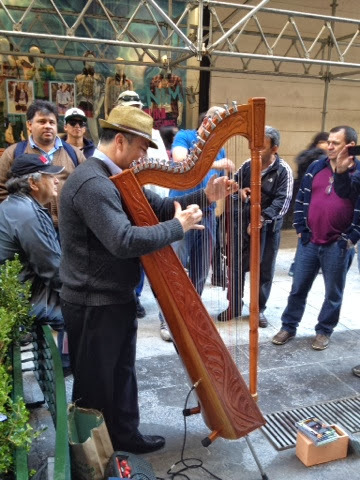 Down town in Buenos Aires can get a little hectic with people rushing around like they are on a mission, the insane amounts of traffic and people yelling “cambio, cambio” every two seconds but it also has a lot to offer. We spent a whole day just wondering around and looking at the beautiful architecture you can see basically everywhere you turn. 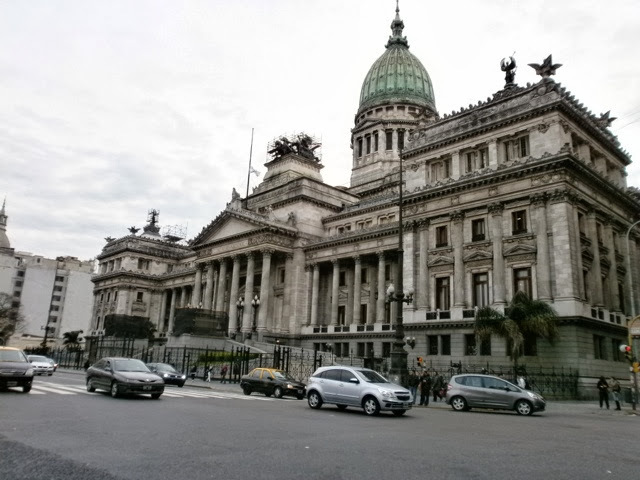 From pretty buildings to churches to big Parliament building, down town Buenos Aires has it all. 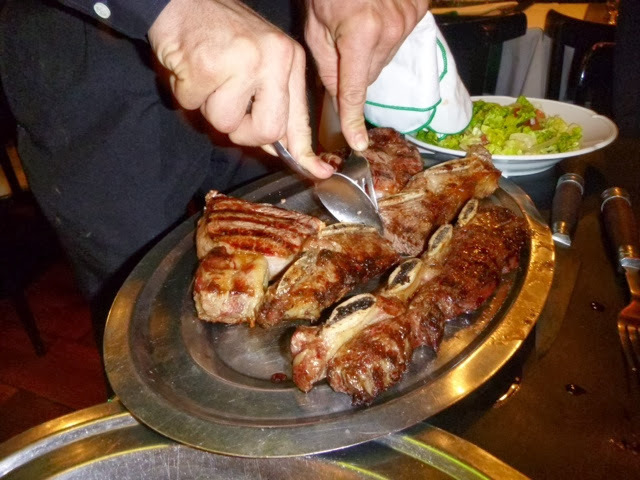 A Parilla is a great thing to order in a restaurant if you are wanting to share a big platter of meat. 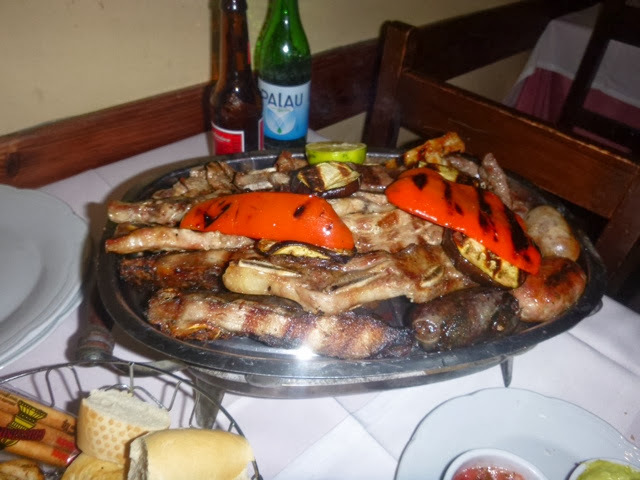 Typically served on a small grill you will get several cuts of meat, chicken, chorizon, blood sausage and all different types of offle ranging from kidneys, liver, intestines and whatever else is on offer. Personally these are not for me, but if you’re up for trying something new give it a go. Argentinians love Parillas! This city hosts some insane nightlife. Every night is a party! Don’t arrive to the clubs until at least 2am, some clubs even 4am. Put your dancing shoes on and be prepared for a big night! The subway system here is fantastic. It can get you to pretty much anywhere around the city and is fast and very cheap. What better way to feel like a local. Avoid peak times unless you wanna be squished like a sardine in a can and hang on to your belongings! Located right in the middle of Palermo is the Zoo. 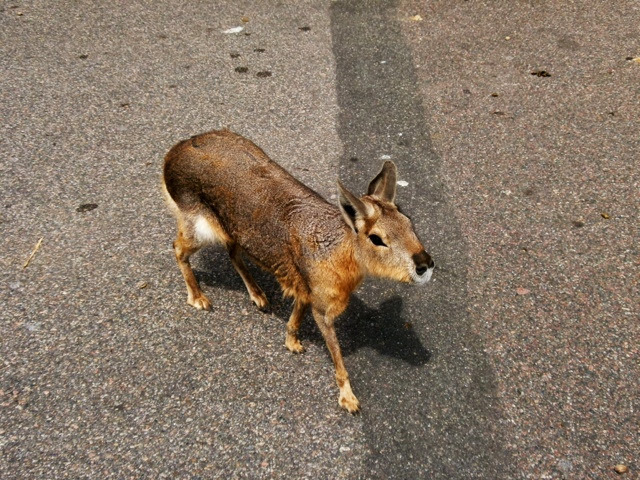 It houses plenty of animals from Lions, White Tigers, Snow Leopards, Red Pandas, exotic birds and monkeys found only in South America and this cute little thing called the Mara that is only found in Argentina and looks like a guinea pig x kangaroo x rabbit in my opinion. You can even feed the animals if you want. Avoid weekends unless you want to line up with hundreds of screaming children. All over the city you will find street performers gathering huge crowds. From Tango fushion music to tango dancers and harp players, you will see it all. 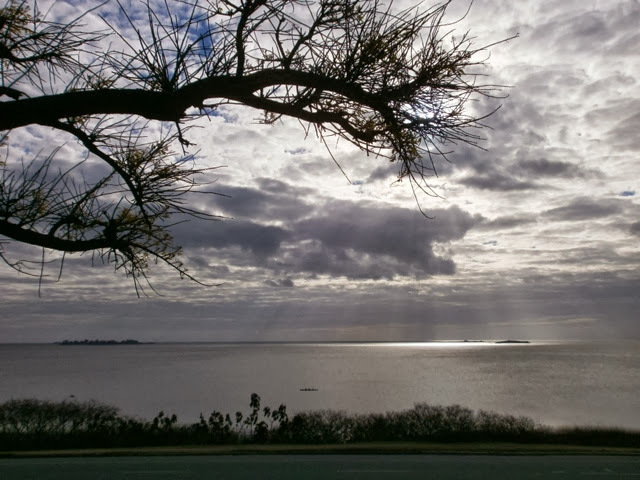 There really is some amazing talent out there and if you take the time to stop and listen or watch, it will really add that something extra special to your day. 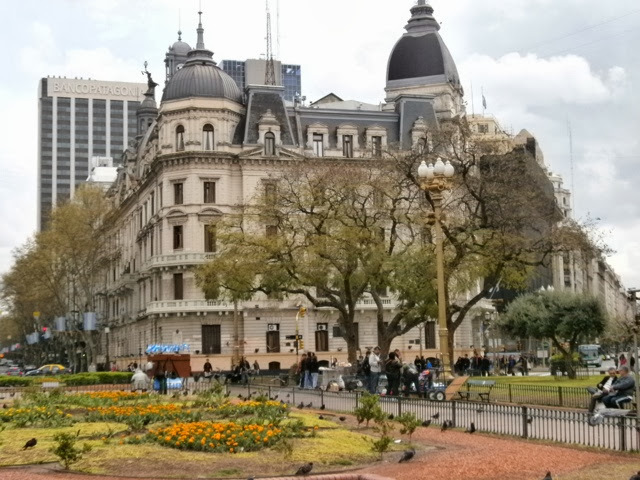 Plaza de Mayo is located down town and has a pretty fountain, lots of pigeons and is surrounded by flowers and pretty buildings. It’s everything a Plaza should, except maybe for relaxing since it’s surrounded by some intense traffic! 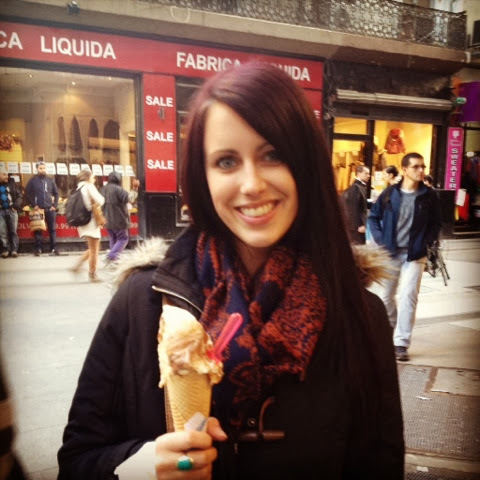 All of Argentina is known for its delicious Helado (ice cream) and Buenos Aires is no exception. Heladarias are found basically everywhere you look and they have huge selections of flavours. From dulce de leche, limon champagne, rum and raisin to tiramisu you will definitely find something to satisfy your taste buds. My favourite is anything with dulce de leche of course! Try the Heladeria ‘Freddo’ for some superb flavours choices.